ROSS Management Services (RMS), an affiliate of ROSS Companies, is one of the most active multifamily property management companies in the Mid-Atlantic region. RMS is focused on strategic growth in emerging markets, as well as core asset year-over-year performance through revenue management and expense controls, while maintaining a commitment to the creation and preservation of value through providing excellent service to the residents of its communities. Part of providing excellent service and creating value is establishing an energy-efficient lifestyle that conserves natural resources and minimizes negative impact on the environment through the use of energy-saving technology. Most recently, ROSS Management Services implemented an LED lighting program at Seven Springs Apartments in early 2015 to provide that experience for its residents. The Seven Springs Apartments wasn’t in need of an overhaul. 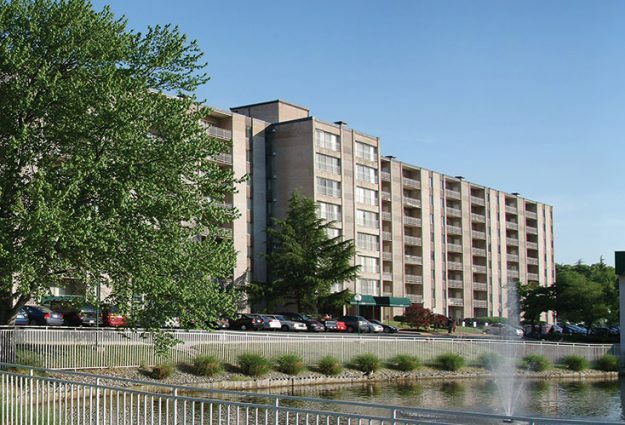 The 982-unit community in College Park, MD, possessed intact structures, a solid occupancy rate and a charm of its own. But ROSS Management Services, which manages the community, knew Seven Springs could improve by replacing highly inefficient incandescent lighting, which would brighten the look and feel of the property and make Seven Springs more competitive with newer product in the market place. Beyond reducing utility costs and improving luminosity, ROSS also wanted to lessen Seven Springs’ carbon footprint and provide a more eco-friendly lifestyle to residents. The challenges were clear enough, but there was one more aspect to factor in. The upgrades had to be done in a financially prudent way that didn’t overextend the capital expenditure budget, and quickly resulted in net operating income gains. The size of the community made it an ambitious task. “We had recently completed a number of successful smaller retrofit projects through NextGen Partners that had resulted in excellent ROI’s and quick payback of project costs, so we were anxious to expand this model to a community as large as Seven Springs Apartments,” said Dave Miskovich, chief operating officer of ROSS Companies. ROSS consulted NextGen Partners, which did a full audit of Seven Springs’ massive 33-acre community, which included 16,864 lights. NextGen recommended an LED lighting solution and soon the install was underway – in common areas, walkways, parking lots and inside apartment homes. One of the primary issues – the community’s poor lighting resulting from its outdated light fixtures – was immediately vanquished. With LED lighting being much more energy-efficient, this also began the process of reducing utility costs and providing a more environmentally conscious lifestyle to residents. “Lighting is the way we experience our asset, so it’s critically important in addition to the energy savings,” Abramson said. “NextGen’s extensive knowledge and experience in dealing with local energy providers, as well as their ability to creatively take advantage of rebate and incentive programs, enabled us to complete the project with little to no upfront capital,” Miskovich said. ROSS worked out an agreement through NextGen that allowed it to offset the costs of the LED implementation directly from the month-to-month energy and inventory savings. The dark – or dim – days are over for Seven Springs, which now has a vibrant, modern feel with character that is on par with newer communities. ROSS Management Services also increased energy efficiency at the community by more than three times. Prior to the changeover, the community’s monthly kilowatt demand sat at about 2.2 million. After the LED implementation, it has reduced to just over 646,000. That’s a reduction of more than 1.5 million kilowatts. Then there is the difference the deft-thinking changeover has made to the bottom line. The changeover is resulting in an annual savings of $182,692. The project cost also included rebates.